If the little girl wouldn’t have kept looking at the two-headed man she could have been in the picture too. Wonder what the dog is standing on? Smiling people and happy, panting puppers! Neat picture Jay! Fast forward to the 1940's, and you could see me in my youth in my Cowboy days. 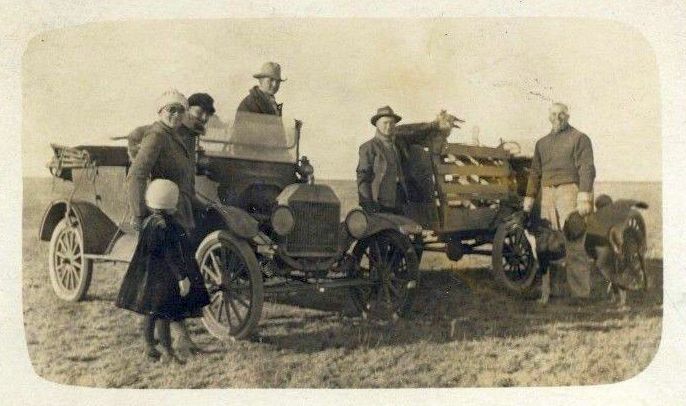 We would oft times be on the Salt Grass Prairie working cattle, and the owner of the Ranch would come out in his old rattle trap car that had a cage on back like this one, with a rope he could pull and let his dogs out. When we would jump a Wolf or Coyote he would take off behind it wide open, and when he got close enough, he would open the gate and out would come tumbling his wolf hounds, and the race would be on. If we were not too busy, we would take off behind it and try to rope it. His wife or the Foreman's wife and kids would sometimes come out like this Lady and kids and watch us work or maybe bring a jug of Ice Tea. Like I said, almost an overlay of all that, and how I so wish that I had pictures like this one of all that.